This time of year, barbecue books tend to show up in anxious clumps. Summer is coming, sure. But so is Father’s Day and that means potential gift giving because the cliche is based on reality: dads love to cook and consume meat! So barbecue is a strong and consistent niche in the cookbook market and, like all niches, some books are better than others. And what makes better? For me, it really always comes down to that all-important trinity: better recipes, great photos and pure innovation. You can kind of fake the first two — and lots of books have both. But you can’t fake true innovation. I mean, let’s face it, how many ways can you grill a steak? Well, several, actually. But once you pick the one you like and get good at it, you’re good to go. And, honestly, a lot of books get the basics right. But to go to the next level? Well, most of the time you have to go somewhere else. When it comes to grilling, Grilling With House of Q (Figure.1) is that somewhere else. First of all, it meets the first two criterion hands down. The recipes are thorough, friendly and lucid. The photos are very good: appetizing, appealing, even a teensy bit avant-garde. But the recipes themselves, and the thought and care put into them are beyond what you might be imagining. Sure: cook a steak. But here cook it half a dozen ways, depending on cut, method, preference. And then we go beyond steak. Way, way beyond. My favorite of all of these is… well, redonkulous. I have not yet had time to make Dinosaur Eggs but I will. And when I do… look out! They are egg-shaped meatloaves stuffed with cream cheese, cheddar, jalapeno peppers, bacon and some other great stuff. I’m going to need to include a photo, because I swoon when I look at them. I can hardly wait to try. More from the OTT innovation department: Cheese-Stuffed Bacon-Wrapped Hot Dogs, Jalapeno and Cheese Cornbread Waffle Burgers, Cranked-Up Meatloaf (more bacon involved here), Spinach-Stuffed Pork Chops, and a barbecue infused classic Mac ‘N’ Cheese that puts all those lobster mac and cheese pretenders in the shade. I could go on, really. 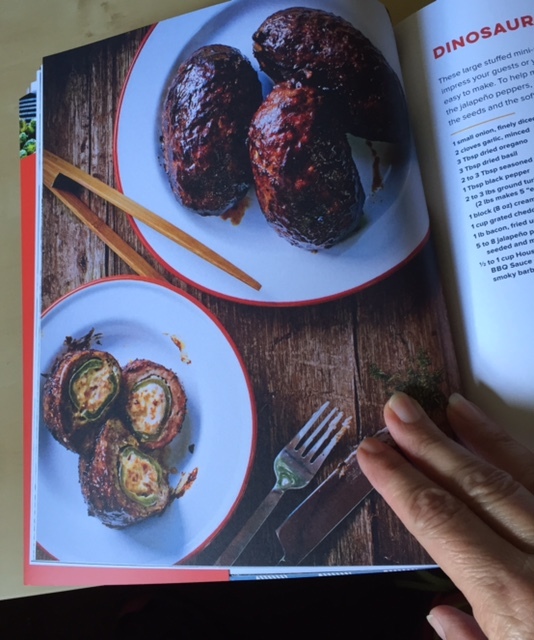 Nothing here is exactly as you’d expect it to be, but neither is it the sort of jumped up different that cookbook authors sometimes do just to pointlessly make it their own. (Pointlessly because, if it isn’t better, why bother?) Everything here is thoughtful and creative. I loved the Grilled Pumpkin-Stuffed French Toast. (Think about it. No. Really.) And the Bacon Baklava made my head spin as it did for everyone at the party I brought it to. The Brussels Sprout Coleslaw is delicious and surprisingly vegetarian. At a time when almost everyone is stuffing bacon into Brussels Sprouts, Misko, of course, is not. Misko’s take on the classics of barbecue are here, too. Pulled pork. Competition-style brisket. Slow-Smoked Ribs. It’s all here, beautifully documented and properly presented. True Detective Season Two: Can Pizzolatto Do It Again?